Just as there are countless strains of cannabis, there are many ways to ingest the plant for its effects. Below is a simple flowchart to help you determine which methods may work best for your intentions, followed by an outline of some of the most common methods available. Smoking the dried flower from the cannabis plant in a pipe, bong, or joint is a common method of ingestion. The chain reaction that occurs upon inhalation happens very quickly and delivers the cannabinoids to your system with extreme efficiency. Onset: Within seconds of inhalation. Duration: Effects will generally peak within thirty minutes and diminish anywhere from 1-3 hours. Pros: Using raw cannabis flower gives users the most control of the strain, source, and cannabinoid content than any other method. Cons: Flower with the same strain name may still vary in potency, source and cannabinoid content. The smoke generated from burning papers and lighter fluid chemicals contain carcinogenic compounds. Users with compromised immune systems or lung problems should consider other methods of cannabis. A smokeless, efficient form of inhalation. Vaporizers heat cannabis plant matter (or its oil) to a temperature that forces trichomes away from the plant into the vapors. Duration: Effects will generally peak before thirty minutes and diminish in a couple of hours. Pros: Portable vaporizers are more discreet than smoking as there is minimal odor, which dissipates quickly. Larger, stationary vaporizers that burn plant material can be one of the cleanest, healthiest ways to consume cannabis. Cons: Some users find that vaporization has weaker effects than other forms of cannabis. Using cartridges and oils from reputable companies is incredibly important as there is a risk of chemical solvents and low quality materials during this transitional period as health and safety regulations are implemented. Care should also be taken when mixing cartridges and pens, as some companies specially formulate their products to work together. 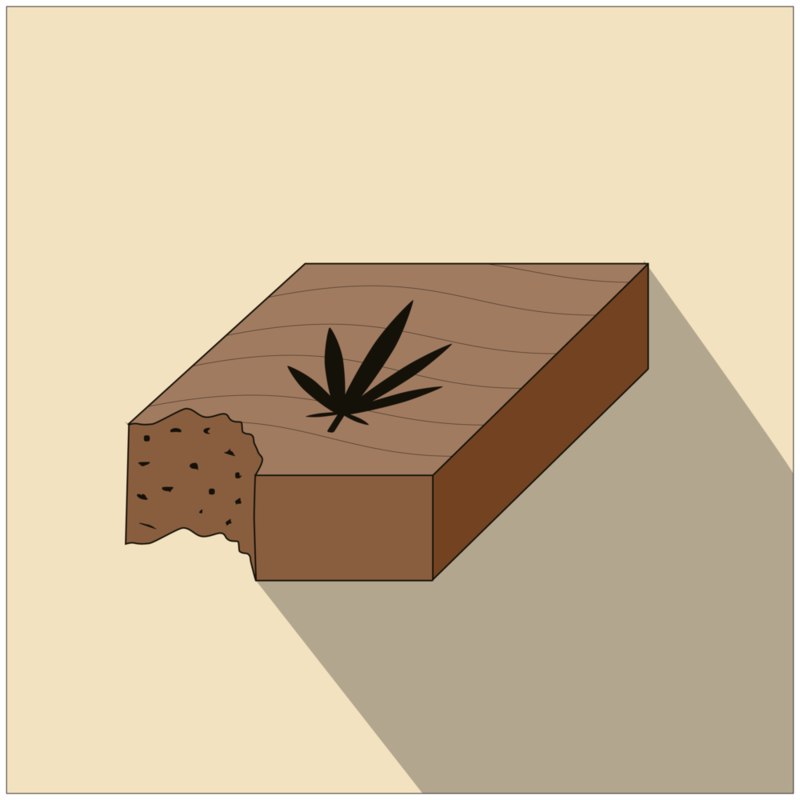 Cannabis in edible form has been a popular method of consumption in the United States since the 1960s. The cannabinoids reach the cells by the way of the liver, which converts THC into another, more potent chemical, 11-hydroxy-THC. Edibles can come in many forms, including sodas, snacks, chocolate, ice cream, pizza, and mints. Onset: Fifteen minutes to two hours depending on metabolism and whether or not the user ingests them on an empty stomach (which accelerates absorption). Duration: Roughly 4-6 hours, though unusually high doses can result in effects lasting over 24 hours. Pros: Effects last longer than other forms of cannabis use. One the most discreet and convenient forms of consumption. Diverse variety of options available. 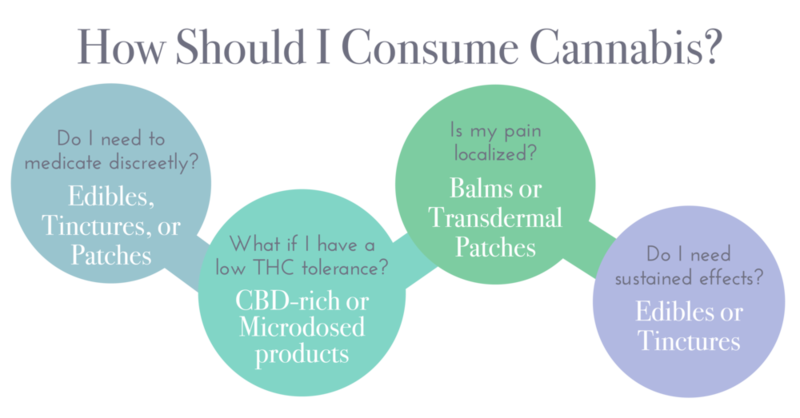 Cons: Edibles are not ideal for users who need immediate relief as the effects take longer to onset. If improperly stored, they can be mistaken for non-infused products. Because of the delayed onset of edibles, some users ingest additional portions in order to achieve their desired effects. This leads to overconsumption and doses that can be overwhelming to users for substantially long periods of time. To learn about options for overconsumption visit our Finding Your Dose section. For more information, make sure to read Edibles 101. Cannabis-based tinctures were a standard American medicine in the late 1800- early 1900s. They are available in a variety of cannabinoid formulations and dosages. Tinctures are absorbed sublingually, so the cannabinoids go directly to the bloodstream. Onset: The onset of alcohol-based tinctures is faster than edibles- but not as rapid as inhalation methods. Full effects are usually felt within 20-30 minutes. Duration: Frequent users may find that effects last for a couple of hours, whereas infrequent cannabis users may feel the effects for several hours. Pros: Some formulas have concentrations of less available cannabinoids like THCV and CBN. Very discreet, with no odor. Cons: Tinctures are commonly formulated with alcohol, which may not be desirable for some users. Light, heat and oxygen will degrade the THC content, so bottles must be opaque and tightly sealed. Ayurvedic practitioners have used cannabis-enriched lotions, balms, salves and other preparations for thousands of years. The cannabinoids are absorbed into the skin for more focused therapeutic effects. Onset: Five minutes to two hours. Duration: Lasting upwards of 12 hours. Pros: Ideal for localized pain and inflammation, including arthritis, bone fractures, skin conditions, cramping, and migraines. No psychoactive effects, so new users and those with a low THC tolerance can use them with confidence. Transdermal patches can provide hours of relief. Very discreet. Cons: Some products may contain parabens or artificial fragrances which can irritate sensitive skin and cause other health issues. High potency THC oil nicknamed for cannabis advocate Rick Simpson, who became a vocal proponent of cannabis’ healing abilities after using a homemade oil to treat his own cancer. His formulation has been expanded upon by other patients and companies, with high THC and CBD variations available in many Collectives. Patients are often advised to start with an amount of oil roughly the size of half a grain of rice, and slowly increase their dose over a prolonged length of time, up to 1 gram per 24 hours. Onset: 15 minutes to 1 hour. Duration: Anywhere from 4 - 10 hours. Pros: Patient success stories, though largely anecdotal, abound online of people using a full spectrum oil to stop the growth of various skin cancers and tumors. Cons: While the anti-proliferative effects of CBD and THC have been documented in studies using animal models, to date there have been no scientific human studies proving the viability of full spectrum oils on specific forms of cancer. If you’d like to pursue this type of treatment, it’s best to do it under the supervision of a licensed integrative oncologist. A relatively new form of cannabis ingestion, 'dabbing' is for high tolerance users only. The term refers to heating a small amount of marijuana concentrate (called a ‘dab’) on the head of a titanium nail with a blowtorch, causing combustion. Don’t let the small amount of cannabis product fool you- this highly potent form of cannabis (also called wax, honey oil, budder, butane honey oil (BHO), and shatter) can contain up to 80% THC. The effects are considerably more physically and psychologically intense than using other forms and can be on par with a strong dose of edibles. Duration: Slightly longer than other inhalation methods. Pros: For seriously ill patients, dabbing can be an efficient way to get a large amount of cannabinoids into their system and experience immediate relief. Users also love the heightened flavors and taste. Cons: The concentrated smoke from dabbing can release carcinogens at degrees over 365. Because of the high THC content, dabbing regularly will quickly raise a user’s tolerance so that other forms of ingestion are no longer felt. The fast uptake of a high level of THC can result in anxiety, nausea, and even passing out.